Compass with straight edges made up of shatter-resistant plastic draws circle from 1/4" to 10" in 1/8" diameter increments. 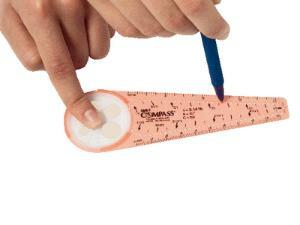 Can be used with pencil or ball-point pen and the straight edge is calibrated inch/metric rules. Delivery information: Supplied with instructions.